Motorola SB6120 SURFboard DOCSIS 3.0 Cable Modem Review - ISP 1 Review by Dan Karas. I just got a great deal one of these from Amazon with FREE Super Saver Shipping and no sales tax. After it was installed, I was pleasingly surprised at the amazing performance boost in my COX Cable Internet speeds. The SB6120 is reasonably priced, Easy to Install, and it's raw speed will blow you away. If your existing Cable modem is more than a couple of years old, you are probably paying the cable Internet provider for more speed than your old modem can deliver. This new Next Generation DOCSIS® 3.0 technology lets you surf up to 4x faster than older DOCSIS 2.0 broadband cable modems. Check out the new DOCSIS 3.0 four channel bonding on the SB6120 Modem Signal display. If your modem is more than 5 years old and uses DOCSIS 1. 1 or older technology, you should definitely upgrade to take advantage of the lightning-fast broadband speeds that the SB6120 can provide. Here's Motorola's manufacturers description of the SB6120: The Motorola SurfBoard eXtreme Cable Modem is capable of reaching data rates up to 150 Mbps. That makes gaming, shopping, downloading, working, high-quality voice and video conferencing, and peer-to-peer networking applications far more realistic, faster, and efficient than ever before. The SB6120 delivers your complete personal media experience, at lightning-fast broadband speed. Get The Best Motorola SB6120 Pricing Here. Installation of the Motorola 6120 was very easy. I had mine up and running in less than 30 minutes. Unbox the Modem, Ethernet cable and power adapter. Connect the Coaxial cable from your Internet provider. Connect the Ethernet cable to your router's WAN port or your computer's network card. Plug in the power adapter and connect to the modem. Call your cable Internet provider and activate your new modem. That's It! - Enjoy your increased Internet speed. The Modem Status Page provides information about the startup process of the Cable Modem. 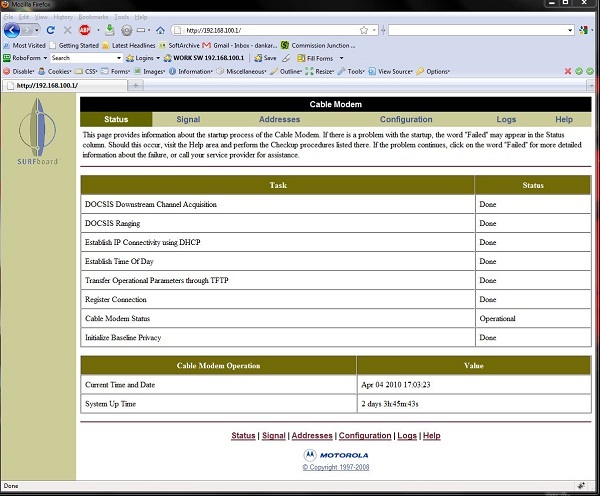 When you first access the Cable Modem, this page is displayed. The last line of the Modem Status Page gives the status of the Cable Modem. Under normal conditions this should read "Operational". If the last line does not read "Operational", a Standard Checkup should be performed. If you type the IP address 192.168.100.1 in your browser you get these SB6120 system menus. The Modem Signal Page provides information about the connection between the Cable Modem and the cable company. If you are getting channel bonding, you'll see it here. 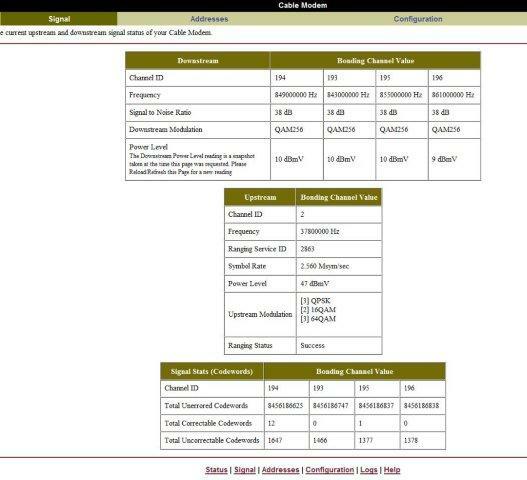 My modem shows 4 bonded channels in the screenshot below. The Modem Addresses Page provides information about the network connection between the Cable Modem and your computer. Also, it provides details about the connection between the Cable Modem and the service provider's computer systems. The Modem Configuration Page provides information about the current configuration of the Cable Modem. The Modem Logs Page provides diagnostic messages generated by the Cable Modem. It is intended for use by a qualified technician. The Modem Help Page provides information about how to troubleshoot the Cable Modem. Check to make sure that the coaxial cable connecting your Cable Modem to the cable wall outlet is connected, and that the screws have been tightened. Check to make sure that the power cord on the Cable Modem is plugged into a wall outlet, and that the Power light on the front of the Cable Modem is on. Check to make sure that the Ethernet cable between the Cable Modem and your computer is connected, and the connectors are locked in place. Check to make sure that the Send, Receive, and Online lights on the front of the Cable Modem are on or blinking. If the lights are off and do not blink, reboot the modem by disconnecting and reconnecting the power plug in the back of the modem. Please consult the Cable Modem User Guide for additional information. The Motorola SB6120 SURFboard DOCSIS 3.0 eXtreme Broadband Cable Modem is not the cheapest modem you can buy, but in my honest opinion it's one of the best values. The SB6120's speed, performance, features, and Excellent Customer Reviews made it a no brainer decision for me. I am very satisfied with the SB6120 cable modem that I purchased and award it five stars. PDF Format - "Motorola SB6120 SURFboard DOCSIS 3.0 Cable Modem Review"
Word Download - "Motorola SB6120 SURFboard DOCSIS 3.0 Cable Modem Review"
Copy & paste the code above on your site. ISP 1 reviews Internet access related products and services. Click Here for an Index of ISP 1's Reviews.